The topic of tonight’s ENG 099 Conversational American English MOOC Lecture was “Reading American Comic Books (1 of 2)” (video above, or click here if you cannot see the video). Lilia was kind enough to attend! You can see the questions and character list of the comic below! Page 1: Where is Ticonda from? Page 2: Why was Professor Carter worried? He knows that Ticonda can be very dangerous for other people! Page 3: Why did it get so cold? Ticonda broke the control panel. 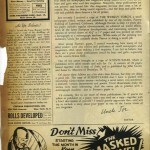 Page 4: What did the Fantom do? He came in through the ceiling and broke the door, so the people could escape. Page 5: Does Ticonda know the Fantom? How do you know? Ticonda knew Fantom from years ago and they had a struggle. Page 6: What happens to the Driver? Ticonda threw the driver out of his car, but The Fantom saved him! Page 7: What do the police want to do? Police want to catch Ticonda. They have the guns because Ticonda is dangerous for them! Page 8: What happened to Ticonda? He died, The Fantom strangled him! Please respect the copyright plus terms and conditions of all links,books and media not by Charlie Danoff. Video by Charlie Danoff. CCA Licensed. 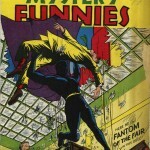 Images from Amazing Mystery Funnies; in the Public Domain per the Digital Comics Museum research. Text Copyright © 2013 by Charlie Danoff. Rights given a CC Zero 1.0 Universal Public Domain Dedication. via the Digital Comics Museum. Public Domain. Watch and take notes on the video from 25:00 to 39:05 (14 minutes and 5 seconds). Do you trust the Fantom? Do you think the Fantom is a man or a woman? Please write the answer in your blog, leave it in the comments, or use Facebook, P2PU and/or Wikiversity. Please respect the copyright plus terms and conditions of all links and media not by Charlie Danoff. Atom Text Copyright © 2013 by Charlie Danoff. Rights given a CC Zero 1.0 Universal Public Domain Dedication. Video “ENG 099 Conversational American English (Sequence 2 Feb/Mar/Apr 2013 Beta) – Lecture 1 Greetings” Copyright © 2013 by Charlie Danoff. Rights given a CC Attribution 3.0 Unported License. 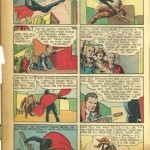 Images of comic Amazing Mystery Funnies Volume 2 #7 via the Digital Comics Museum. Public Domain. See the first part of Language Talk in Atom 3. Teacher.—What did you learn in the previous Lesson? Pupil.— I learned that a spoken word is composed of certain sounds, and that letters are signs of sounds, and that spoken and written words are the signs of ideas. This question should be passed from one pupil to another till all of these answers are elicited. T.- All the written words in all the English books ever made, are formed of twenty-six letters, representing about forty sounds. These letters and these sounds make up what is called artificial language. Of these twenty-six letters, a, e, i, o, u, and sometimes w and y, are called vowels, and the remainder are called consonants. In order that you may understand what kind of sounds the vowels stand for, and what kinds the consonants represent, I will tell you something about the human voice. T.- The air breathed out from your lungs beats against two flat muscles, stretched like strings across the top of the windpipe, and causes them to vibrate. This vibrating makes sound. Take a thread, put one end between your teeth, hold the other in your fingers, draw it tight and strike it, and you will understand how voice is made. Figure 5: The Lungs pushing air up into the windpipe. T.- If the voice thus produced comes out through the mouth held well open, a class of sounds is formed which we call vowel sounds. But, if the voice is held back by your palate, tongue, teeth, or lips, one kind of consonant sounds is made. If the breath is driven out without voice, and is held back by these same parts of the mouth, the other kind of consonant sounds is formed. Ex. 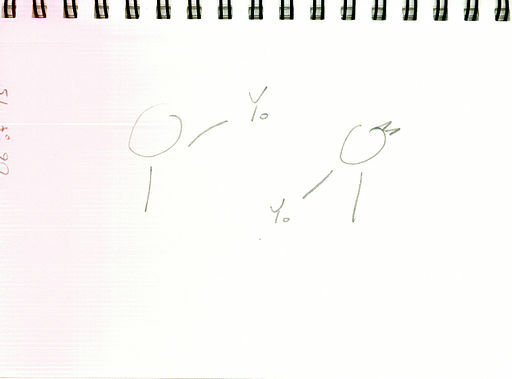 of both: b, d, g; p, t, k.
You are now prepared to understand what I mean when I say that the vowels are the letters which stand for the open sounds of the voice, and that the consonants are the letters which stand for the sounds made by the obstructed voice and the obstructed breath. DEFINITION.—Artificial Language, or Language Proper, consists of the spoken and written words used to communicate ideas and thoughts. DEFINITION.—English Grammar is the science which teaches the forms, uses, and relations of the words of the English Language. Watch and take notes on the video from 15:30 to 25:30 (10 minutes). If you can, take a picture and put it on your blog! Did using the string help you better understand how voice is made? Yes or No? Why? Please write the answer in your blog, leave it in the comments, or use Facebook, P2PU and/or Wikiversity. 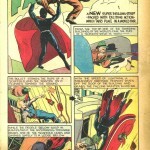 Atom Text Copyright © 2012 by Charlie Danoff. Rights given a CC Zero 1.0 Universal Public Domain Dedication. Language Talk: Adapted from Pages 72 to 73 of ”The Uncertainty Principle Volume Orange Issue Four ‘Over the Horizon’” via the Internet Archive. Copyright © 2012 The Uncertainty Principle; Edited by Charles Jeffrey Danoff; pages Co-Authored by Alonzo Reed and Brainerd Kellogg. Rights dedicated to the Public Domain by Editor via the Creative Commons Zero 1.0 Universal Public Domain Dedication. This atom is an introduction to formal telephone English that you can use for work, business, talking to a teacher or other formal conversations. Please study these vocabulary words before doing the reading and video watching below. Please watch and take notes on the video below from 4:04 to 16:19 [12 minutes 15 seconds] to see “Informal Telephone English” explained by Mr. Danoff. The dialogue text is published below the video. If you can’t see the video below, click here to watch it on YouTube. When would you use informal telephone English? What do you prefer, going out or staying in? Tonight was the second ENG 099 Conversational American English lecture of the Feb/Mar/April 2013 sequence. It was the second of 2 orientation lectures for online students. And you can read the lecture notes by clicking here. The most important thing is to start your course blog like Alex! Watch last night’s lecture for instructions! Please respect the copyright plus terms and conditions of all links, books and media not by Charlie Danoff. Unless otherwise noted, class recap text Copyright © 2013 by Charlie Danoff. Rights given a CC Zero 1.0 Universal Public Domain Dedication. Tonight was the first ENG 099 Conversational American English lecture of the Feb/Mar/April 2013 sequence. It was one of 2 orientation lectures for online students and Lilia joined me and started her new blog for the class! Tomorrow night I will again be hosting an online orientation lecture for any students who were not able to join tonight! 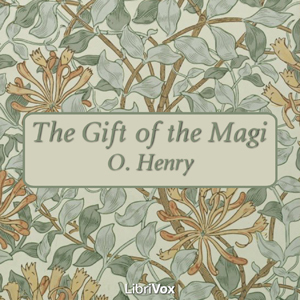 Students and teacher read this short story “The Gift of the Magi” by O. Henry. It is a Christmas story and given this is a December course it’s especially appropriate. 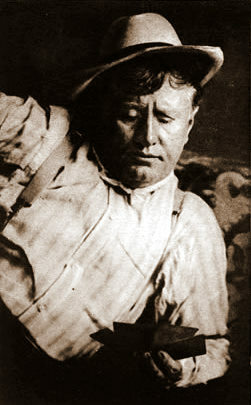 O. Henry is a famous American author from the early 20th century. magi n. pl. IPA: /meɪˈd͡ʒaɪ/ plural form of mage, or magician; “wise men or philosophers of the East” (Webster’s 1828). imputation n. IPA: /ˌɪm.pjʊˈteɪ.ʃən/ a charge, saying someone did something bad; an accustion, the act of imputing or charging; attribution; ascription; also, anything imputed or charged. parsimony n. IPA: /ˈpɑr səˌmoʊ ni/ not spending a lot of money; cheap; thrifty; closeness or sparingness in the expenditure of money. shabby adj. IPA: /ˈʃæb.i/ old and dirty place or thing; poor; ragged. flat n. IPA: /flæt/ apartment, floor, loft, or story in a building; especially, a floor of a house, which forms a complete residence in itself. Please read the text below twice and take notes. Now listen and take notes on this recording from the beginning to 1:22 to hear this lecture’s text of the short story. We will read all of it over the course of the 10 lessons. If you can’t see the audio player above, please click here to listen to it in the Wikimedia Commons (commons.wikimedia.org). You can also download the 128Kbps MP3 (15.3 MB), Ogg Vorbis (17.6 MB), and/or 64 Kbps MP3 (7.7 MB) files from the Internet archive. Please watch and take notes on the video below from 29:05 to 37:30 [4 minutes 50 seconds] to see “Language Talk 1” explained by Mr. Danoff. Did you like the text, yes or no? Why do you think Della is not happy? Please leave your answer in the comments, or via Facebook, P2PU and/or Wikiversity. Christmas Short Story 1 of 10 adapted from “The Gift of the Magi,” part of O. Henry’s 1906 collection of Short Stories “The Four Million.” Public Domain in the US, because it was published in the US before 1923 and therefore is in the public domain due to copyright expiration. Read online from The University of Auburn and/or Wikisource. Lecture 1 from 29:05 to 37:30 via YouTube. Copyright © 2012 by Charlie Danoff/Mr. Danoff’s Teaching Laboratory. Rights Available under the Creative Commons Attribution 3.0 Unported License. “The Gift of the Magi” recording by Marian Brown for Librivox. All Librivox recordings are available under the under the Creative Commons Public Domain Certification. Originally published via Librivox. Librivox Recording of The Gift of the Magi Album Art Cover design by Janette Brown. This design is in the public domain per the PDF. Portrait of Porter from frontispiece in his collection of short stories, Waifs and Strays. O. Henry. “William Sydney Porter, Wiafs and Strays frontispiece” via Wikimedia Commons. By unattributed (Austin History Center, Austin Public Library). The work of art itself is in the public domain for the following reason: because its first publication occurred prior to January 1, 1923. This media file is in the public domain in the United States. See “Copyright Term and the Public Domain in the United States” (1 January 2012) by Peter B. Hirtle for more about Public Domain in the USA. bud, n. IPA: /bʌd/ a small bump on a plant stem; a future leaf or flower. sign, n. IPA: /saɪn/ that by which anything is made known or represented; that which shows evidence; a mark; a token; an indication; a proof. 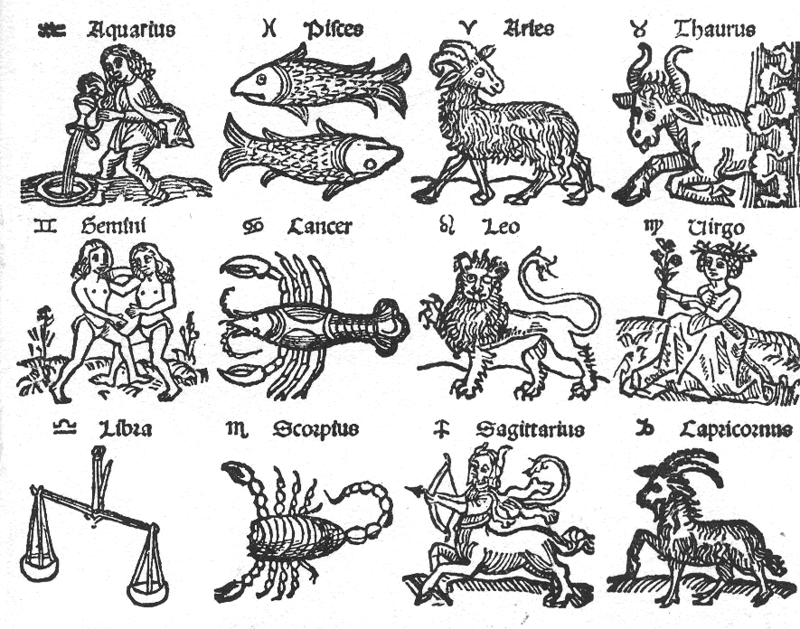 The pictures of animals are signs of the creature names above. mental, adj. IPA: /mɛntəl/ to do with the mind; intellectual. idea, n. IPA: /aɪˈdiə/ a picture in your mind; a future plan: an image formed in the mind of something you may not see in front of you; a notion. These “Language Talks” are designed to give you a useful way to think about English. Read the dialogue below twice and write down your answers to the teacher’s questions. Teacher— I will pronounce these three sounds very slowly and distinctly, thus: b-u-d. Notice, it is the power, or sound, of the letter, and not its name, that I give. What did you hear? T.— I will bold these words, so that you can see them, three letters—b-u-d. Are these letters, taken separately, signs to you of anything? T.— What then do these letters, taken separately, picture to your eye? Student.— They picture the sounds that came to my ear. 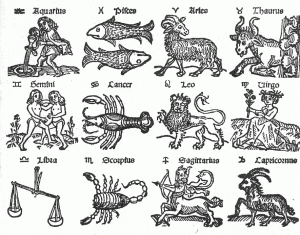 T.— Letters then are the signs of what? S.— Letters are the signs of sounds. 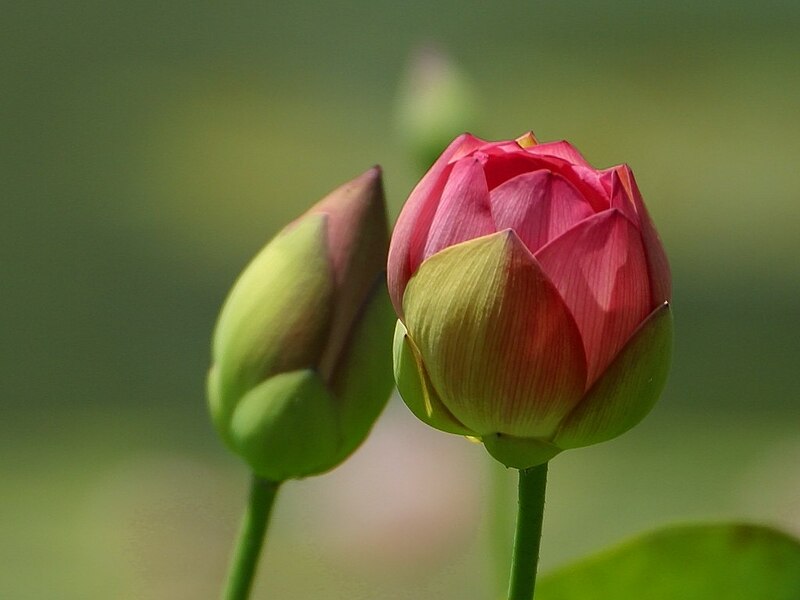 T.— I will pronounce the same three sounds more rapidly, uniting them more closely: bud. These sounds, so united, form a spoken word. Of what do you think when you hear the word bud? S.— I think of a little round thing that grows to be a leafy branch or a flower. T.— Did you see the thing when you were thinking of it? T.— Then you must have had a picture of it in your mind. We call this mental picture an idea. What called up this idea? S.— It was called up by the word bud, which I heard. T.— A spoken word then is the sign of what? Please watch and take notes on the video below from 23:30 to 28:20 [4 minutes 50 seconds] to see “Language Talk 1” explained by Mr. Danoff. Now that you have watched the video, look back at your answers to the questions asked by the teacher in the dialogue. Think deeply about your answers again, and change them if you have a better idea. In the comments below write 2 to 4 sentences explaining the differences and similarities between your original answers and those in the linked full text. What were the differences? Or, were they the same? Language Talk: Adapted from Pages 72 to 73 of “The Uncertainty Principle Volume Orange Issue Four ‘Over the Horizon’” via the Internet Archive. Copyright © 2012 The Uncertainty Principle; Edited by Charles Jeffrey Danoff; pages Co-Authored by Alonzo Reed and Brainerd Kellogg. Rights dedicated to the Public Domain by Editor via the Creative Commons Zero 1.0 Universal Public Domain Dedication. Lecture 1 from 23:30 to 28:20 via YouTube. Copyright © 2012 by Charlie Danoff/Mr. Danoff’s Teaching Laboratory. Rights Available under the Creative Commons Attribution 3.0 Unported License. Atom 3: Language Talk 1 Figure 1 – Bud Vocabulary Picture Example via PDPhoto.org. “Some flowers at Balboa Park” Copyright © 2002 by PDPhoto.org. Rights dedicated to the Public Domain under the Creative Commons Public Domain Certification. Atom 3: Language Talk 1 Figure 2 – Signs Vocabulary Picture Example via Wikimedia Commons. The work of art itself is in the public domain for the following reason: This work is in the public domain in the United States, and those countries with a copyright term of life of the author plus 100 years or less. Atom 3: Language Talk 1 Figure 3 – Idea Vocabulary Picture Example via Wikimedia Commons. 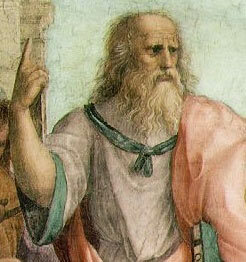 The School of Athens (Raphael detail). Fresco, Stanza della Segnatura, Palazzi Pontifici, Vatican. This is a faithful photographic reproduction of an original two-dimensional work of art. The work of art itself is in the public domain for the following reason: This work is in the public domain in the United States, and those countries with a copyright term of life of the author plus 100 years or less. What’s up? = How are you? Not much = I’m fine. = Fine, thank you. Please watch and take notes on the video below from 6:52 to 11:25 [4 minutes 33 seconds] to see the “Friendly American English Greeting” explained by Mr. Danoff. Pay close attention when he discusses appropriate and inappropriate times to use this greeting. It is not appropriate for formal settings, e.g. work; with your teachers and/or when talking to the government. Please click through the 3 slides below in the gallery and read the captions below to go over the Friendly American English Greeting again. Video 1: Lecture 1 from 3:00 to 6:36 via YouTube. Copyright © 2012 by Charlie Danoff/Mr. Danoff’s Teaching Laboratory. Rights Available under the Creative Commons Attribution 3.0 Unported License. 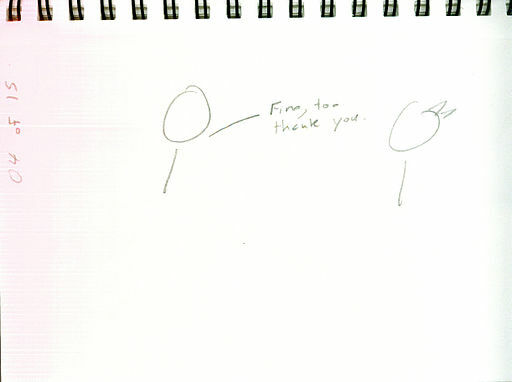 Figure 1: Friendly American English Greeting Slide 1 of 3 via Wikimedia Commons. Copyright © 2011 by Charlie Danoff/Mr. Danoff’s Teaching Laboratory. Rights dedicated to the Public Domain under the Creative Commons Zero 1.0 Universal Public Domain Dedication. Figure 2: Friendly American English Greeting Slide 2 of 3 via Wikimedia Commons. Copyright © 2011 by Charlie Danoff/Mr. Danoff’s Teaching Laboratory. Rights dedicated to the Public Domain under the Creative Commons Zero 1.0 Universal Public Domain Dedication. 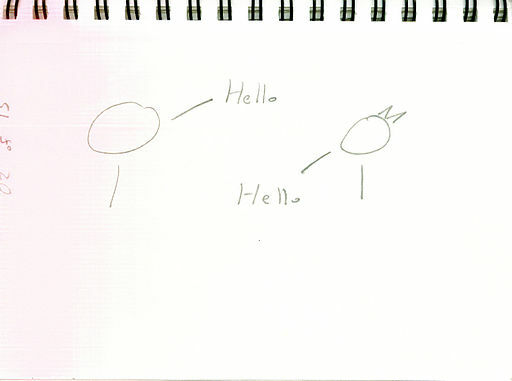 Figure 3: Friendly American English Greeting Slide 3 of 3 via Wikimedia Commons. Copyright © 2011 by Charlie Danoff/Mr. Danoff’s Teaching Laboratory. Rights dedicated to the Public Domain under the Creative Commons Zero 1.0 Universal Public Domain Dedication. I’m fine. = Fine, thank you. Please watch and take notes on the video below from 3:00 to 6:36 [2 min. 36 seconds] to see “International English” Greeting explained by Mr. Danoff! Please consult these slides with the text below from A and B to practice the International English Greeting again. Do you like the “International English” Greeting? Why or why not? Figure 1: International English Greeting Slide 1 of 3 via Wikimedia Commons. Copyright © 2011 by Charlie Danoff/Mr. Danoff’s Teaching Laboratory. Rights dedicated to the Public Domain under the Creative Commons Zero 1.0 Universal Public Domain Dedication. Figure 2: International English Greeting Slide 2 of 3 via Wikimedia Commons. Copyright © 2011 by Charlie Danoff/Mr. Danoff’s Teaching Laboratory. Rights dedicated to the Public Domain by author under the CC0 PD Dedication. Figure 3: International English Greeting Slide 3 of 3 via Wikimedia Commons. Copyright © 2011 by Charlie Danoff/Mr. Danoff’s Teaching Laboratory. Rights dedicated to the Public Domain by author under the CC0 PD Dedication. The lecture was recorded and is available below as a YouTube video. If you cannot see the video above, watch it on YouTube directly. 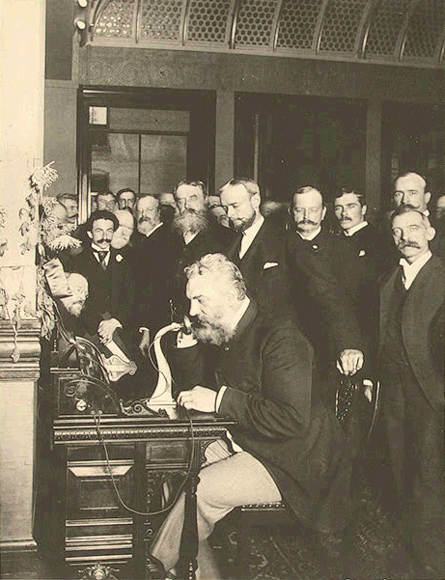 The picture below show Alexander Grahm Bell with one of the world’s earliest telephones. He was probably using formal telephone English! Formal telephone English is what you use over the phone talking to someone at work; teachers and school officials; the government and to people you respect. A good choice to start a formal phone conversation is “Hello. How are you?” while “Yo. 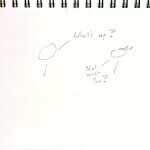 What’s up?” is better for talking with your friends as was discussed last lesson plan. These 2 words come up in the lecture recording’s example formal telephone English conversation. Please watch “Learn English 4-2 : Answering the Phone” from the FreeEnglish Video YouTube Channel twice. Read and take notes on both About.com’s Telephone Conversations ESL handout and Englishclub.com’s Telephone tips page. See the first part of Language Talk in Lecture 1. See the first part of this story in Lecture 1. The “Dillingham” had been flung to the breeze during a former period of prosperity when its possessor was being paid $30 per week. Now, when the income was shrunk to $20, the letters of “Dillingham” looked blurred, as though they were thinking seriously of contracting to a modest and unassuming D. But whenever Mr. James Dillingham Young came home and reached his flat above he was called “Jim” and greatly hugged by Mrs. James Dillingham Young, already introduced to you as Della. Which is all very good. Publish your notes from the Formal Telphone English Recommended Video (2.1) and Readings (2.2). Follow the example from Language Talk (3.0) “Take a thread, put one end between your teeth, hold the other in your fingers, draw it tight and strike it, and you will understand how voice is made.” put a picture of yourself holding a string from your mouth and write 2 to 3 sentences about the experience. Write a paragraph describing your apartment, try to use the same style as O. Henry (4.0) in section focus on descriptive details. Please respect the copyright plus terms and conditions of all links and media not by Charlie Danoff. 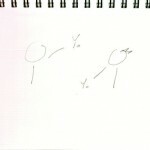 Blog post text Copyright © 2012 by Charlie Danoff. Rights given a CC Zero 1.0 Universal Public Domain Dedication. Recording of this lecture that aired on December 10th, 2012 at 19:00 USA CT. Teacher and students introduce themselves to one another. This first lecture is about American English greetings, as well as setting up the rest of the 10 week course. Begin by eliciting what students know about American greetings and English greetings in general. If you can’t see the video above, please click here to view it on the Internet Archive (archive.org). You can also download the Cinepack (254.1 MB), Ogg Video (17.6 MB), and/or MPEG4 (18.9 MB) files from the Internet archive. Go through how the class will work and answer any questions. If you make a new blog for your ENG 099 posts, e-mail contact@mr.danoff.org its URL. If you use a blog you already have, please e-mail contact@mr.danoff.org the tag’s RSS feed. E-mail Mr. Danoff all 10 URLs by 23:59 USA CT on December 24th the URLs to your completed, published assignments. After approval, you will receive your official ENG 099 MOOC December 2012 Badge and PDF Certificate of Completion! Optionally, for $25 (USA) or $35 (International) you can have a print copy of your certificate mailed, plus a LinkedIn recommendation from Mr. Danoff. After you have successfully registered, Mr. Danoff will e-mail you a username and password for this website. For each assignment, you are required to post the URL to your answers published elsewhere online. We will read and discuss this conversation about the English language. Listen from the beginning to 1:22 to hear this lecture’s text of the short story. We will read all of it over the course of the 10 lessons. Figure 12: “The Gift of the Magi” audio recording. Find out if there is anything specific the students want to learn about next lecture (tomorrow). Why do you want to improve your English? or, What is your English studying goal? In the Language Talk section, the Teacher says “A spoken word then is the sign of what?” please answer the question in your own words. (2 to 3 sentences). What did we learn or change? What else should we change going forward? 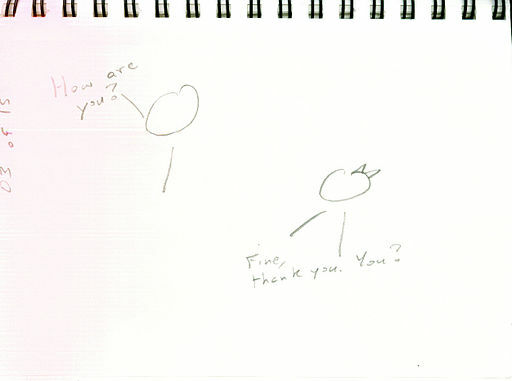 “ESL 101 Conversational American English | Lesson 1: Greetings” Copyright © 2011 by Charles Jeffrey Danoff. Rights dedicated to the Public Domain by author via the Creative Commons Zero 1.0 Universal Public Domain Dedication. 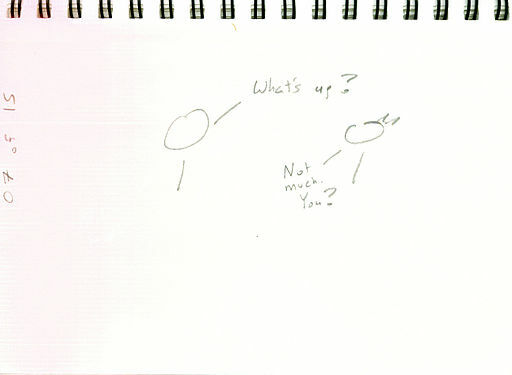 Originally published via the Internet Archive (http://archive.org/details/Esl101ConversationalAmericanEnglishLesson1Greetings). “ESL 101 Lesson 1 Image 2” Copyright © 2011 by Charles Jeffrey Danoff. Rights dedicated to the Public Domain by author via the Creative Commons Zero 1.0 Universal Public Domain Dedication. Originally published via Wikimedia Commons (http://commons.wikimedia.org/w/index.php?title=File:ESL_101_Lesson_1_Image_2.jpg&oldid=61938169). “ESL 101 Lesson 1 Image 3” Copyright © 2011 by Charles Jeffrey Danoff. Rights dedicated to the Public Domain by author via the Creative Commons Zero 1.0 Universal Public Domain Dedication. Originally published via Wikimedia Commons (http://commons.wikimedia.org/w/index.php?title=File:ESL_101_Lesson_1_Image_3.jpg&oldid=53501822). 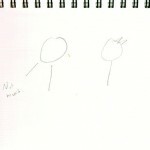 “ESL 101 Lesson 1 Image 4” Copyright © 2011 by Charles Jeffrey Danoff. Rights dedicated to the Public Domain by author via the Creative Commons Zero 1.0 Universal Public Domain Dedication. Originally published via Wikimedia Commons (http://commons.wikimedia.org/w/index.php?title=File:ESL_101_Lesson_1_Image_4.jpg&oldid=61938170). “ESL 101 Lesson 1 Image 6” Copyright © 2011 by Charles Jeffrey Danoff. Rights dedicated to the Public Domain by author via the Creative Commons Zero 1.0 Universal Public Domain Dedication. Originally published via Wikimedia Commons (http://commons.wikimedia.org/w/index.php?title=File:ESL_101_Lesson_1_Image_6.jpg&oldid=65915678). “ESL 101 Lesson 1 Image 7” Copyright © 2011 by Charles Jeffrey Danoff. Rights dedicated to the Public Domain by author via the Creative Commons Zero 1.0 Universal Public Domain Dedication. Originally published via Wikimedia Commons (http://commons.wikimedia.org/w/index.php?title=File:ESL_101_Lesson_1_Image_7.jpg&oldid=65915683). 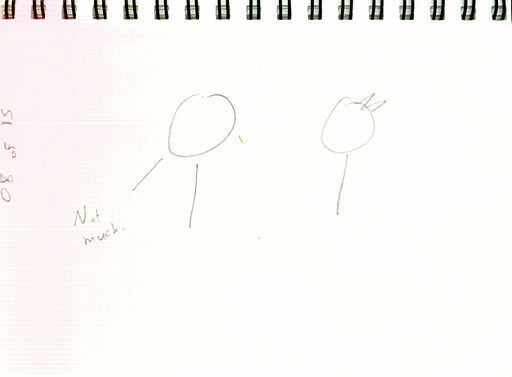 “ESL 101 Lesson 1 Image 8” Copyright © 2011 by Charles Jeffrey Danoff. Rights dedicated to the Public Domain by author via the Creative Commons Zero 1.0 Universal Public Domain Dedication. Originally published via Wikimedia Commons (http://commons.wikimedia.org/w/index.php?title=File:ESL_101_Lesson_1_Image_8.jpg&oldid=74323944). Pages 72 to 73 of “The Uncertainty Principle Volume Orange Issue Four ‘Over the Horizon'” Copyright © 2012 The Uncertainty Principle; Edited by Charles Jeffrey Danoff; pages Co-Authored by Alonzo Reed and Brainerd Kellogg. Rights dedicated to the Public Domain by Editor via the Creative Commons Zero 1.0 Universal Public Domain Dedication. Originally published via the Internet Archive (http://archive.org/details/theup_volume_orange_issue_4_ebook). Page 73 of Danoff, Reed, Kellogg (2012). “Some flowers at Balboa Park” Copyright © 2002 by PDPhoto.org. Rights dedicated to the Public Domain via the Creative Commons Public Domain Certification. Originally published via PDPhoto.org (http://pdphoto.org/PictureDetail.php?mat=&pg=5816). “The Gift of the Magi” is part of O. Henry’s 1906 collection of Short Stories “The Four Million.” Public Domain in the US, because it was published in the US before 1923 and therefore is in the public domain due to copyright expiration (Cf. Peter B. Hirtle of Cornell University’s Copyright Term and the Public Domain in the United States 1 January 2012 for more info). “The Gift of the Magi” recording by Marian Brown for Librivox. All Librivox recordings are available under the via the Creative Commons Public Domain Certification. Originally published via PDPhoto.org (http://pdphoto.org/PictureDetail.php?mat=&pg=5816). Originally published via Librivox (http://librivox.org/the-four-million-by-o-henry/). To the extent possible under law, Charles Danoff has waived all copyright and related or neighboring rights to ENG 099 Conversational American English MOOC. This work is published from: United States. If you are interested in advertising in this footer, please e-mail c at danoff dot org with "Advertising Inquiry for ENG 099" in the subject line. Thank you. Buy your instructor, Mr. Danoff's, debut novella, now on Amazon!